NEW YORK (CNN) -- After spending nearly 28 years in an irreversible coma, heiress and socialite Martha "Sunny" von Bulow died Saturday in a New York nursing home, according to a family statement. She was 76. 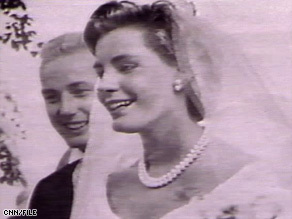 Sunny von Bulow is pictured during her 1957 wedding to Prince Alfred von Auersperg. Von Bulow was subject of one of the nation's most sensational criminal cases during the 1980s. Her husband, Claus, was accused of trying to kill her with an overdose of insulin, which prosecutors alleged sent her into the coma. He was convicted of making two attempts on her life, but the conviction was overturned on appeal. He was acquitted in a second trial. His retrial in 1985 received national attention. "We were blessed to have an extraordinarily loving and caring mother," said the statement from Von Bulow's three children -- Annie Laurie "Ala" Isham, Alexander von Auersperg and Cosima Pavoncelli -- released by a spokeswoman. "She was especially devoted to her many friends and family members." Martha von Bulow was born Martha Sharp Crawford into a wealthy family. She inherited a fortune conservatively estimated at $75 million, according to an article on the von Bulow case posted on truTV.com's Crime Library Web site. In her early years, she drew comparisons to actress Grace Kelly. She became known as Princess von Auersperg with her first marriage, to Prince Alfred von Auersperg of Austria. That marriage produced two children: Alexander and Annie Laurie. The von Bulows married in 1966 and had a daughter, Cosima. On the morning of December 22, 1980, family members found Martha von Bulow unconscious in the bathroom of the family's posh Newport, Rhode Island, home. She never regained consciousness. She had been hospitalized a year earlier after lapsing into a coma but recovered, according to the Crime Library site. Doctors had diagnosed her with hypoglycemia, or low blood sugar. Prosecutors accused Claus von Bulow of twice attempting to kill his wife by injecting her with insulin. The case also led to a major motion picture, "Reversal of Fortune." Actor Jeremy Irons won an Oscar for his portrayal of Claus von Bulow. Famed defense attorney Alan Dershowitz, who won Claus von Bulow a new trial on appeal after his conviction, said in a statement Saturday that Martha von Bulow's death is "a sad ending to a sad tragedy that some members of her family tried to turn into a crime. We proved overwhelming[ly] that there was no crime and that the coma was self-induced. We saved his life, but could not save hers." Claus von Bulow's defense team maintained that Martha von Bulow's alcohol use, among other factors, caused her coma. Dershowitz said he had spoken with Claus von Bulow, who now lives in London, England. Claus von Bulow was saddened by his former wife's passing, Dershowitz said. The family statement said Martha von Bulow is survived by her children, their spouses and nine grandchildren. Alexander von Auersperg and Ala von Auersperg Isham, who had sided with prosecutors against Claus von Bulow, filed a civil suit against their stepfather after his acquittal. The case was settled out of court in 1987, according to a 2007 article in the Providence Journal newspaper in Rhode Island. Claus von Bulow had agreed to waive his claim to his wife's money and to a divorce in exchange for the suit being dropped. The von Bulows' daughter, Cosima, sided with her father. Ala von Auersperg Isham served for a time as president of the Sunny von Bulow Coma and Head Trauma Research Foundation, according to the Providence Journal. An offshoot of that organization, the Brain Trauma Foundation, still operates in New York, the newspaper said. The family statement notes that Martha von Bulow actively supported the Metropolitan Museum of Art, the Metropolitan Opera and the J.P. Morgan Library in New York and the Preservation Society of Newport, Rhode Island. A private memorial service will be held for family and friends in New York in the coming days, the family statement said Saturday, along with a private burial. CNN's Julian Cummings contributed to this report.